Alias Factor combines bit crushing and low pass filtering in a unique way, allowing you to decimate your audio to create tones as varied as vintage samplers, cell phones, or old video games. Decimator effects are nothing new, but Alias Factor generates this effect using a special technique that generates aliasing without the unwanted harsh effects provided by other options, offering sounds that are grainy in a “smooth” and organic way. Alias Factor also allows for further creation of attention grabbing new timbres by linking a low pass resonant filter to the decimator for a new means of tweaking your sound. For more information, see the Alias Factor online Help. The Boost 11 Peak Limiter is a transparent peak limiting and volume maximizing plug-in for mixing and mastering purposes; it is designed to reduce peak levels without coloring the sound. 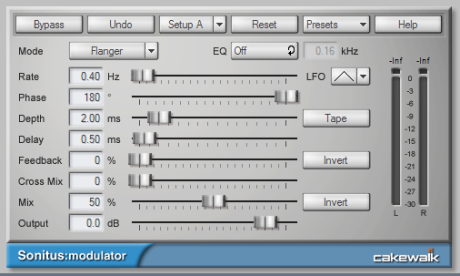 Boost 11 uses a “look-ahead” limiter algorithm to prevent output clipping and PDR (Program Dependent Release) to minimize pumping (audible fluctuations of the volume) and maximize the loudness. “Look-ahead” means the limiter analyzes the audio input ahead of time by delaying the output for approximately 1.5 ms. Boost 11 supports sampling rates up to 192 kHz, mono and stereo operation, and double precision processing. For more information, see the Boost 11 Peak Limiter online Help. 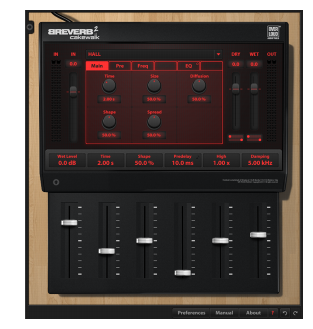 BREVERB SONAR by Overloud provides world-class studio reverb. Dozens of professional presets are included, covering a wide range of applications from mixing to post-production. SONAR includes both VST and ProChannel versions of BREVERB SONAR. 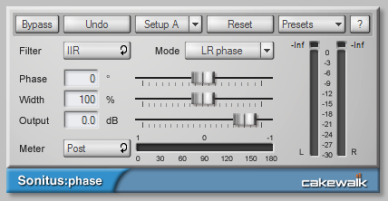 For details, click the Help button in the BREVERB SONAR VST version. The Channel Tools plug-in provides easy and powerful channel processing for gain, Mid-Side decoding, delay and stereo panning. Channel Tools is ideal for enhancing and adjusting stereo separation for stereo tracks and full mixes. Use intuitive controls to easily place the left and right channels individually anywhere in the stereo space. Enhance the spatial characteristics of your mixes. Adjust for phase problems due to microphone placement. Swap the left and right channels. Invert the polarity (phase) of each channel. For more information, see the Channel Tools online Help. This is a classic phaser effect that uses a modulating notch filter with a feedback loop. The “Quadra” mode provides extra wide imaging and animation. For more information, see the Classic Phaser online Help. Stereo Compressor/Gate combines a compressor and a gate into a single effect, so you can increase the overall dynamic level of an audio signal, without distorting the loud parts, and without excessively boosting low-level noise. You can manually trigger the gate via MIDI, which makes it simple to produce stuttering effects. For more information, see the Stereo Compressor/Gate online Help. HF Exciter lets you enhance the higher end of the frequency spectrum. This produces the psycho-acoustic affect that the signal is brighter and clearer. This is done by adding harmonic content that is not present in the original signal. For more information, see the HF Exciter online Help. Unlike traditional equalizers, LP-64 EQ provides highly accurate control of tonal balance while maintaining a linear-phase shift at all frequencies, regardless of the gain settings. Phase-shifting in typical equalizers means that audio material is shifted in time in a frequency-dependent way. Alignment of low and high frequencies may have changed with respect to one another and to the original audio material. In other words, the sound is literally “pulled apart” in time, often resulting in loss of sonic clarity and crispness. With LP-64 EQ linear-phase processing, the integrity of your audio is maintained for all frequencies, at all times—no unintended coloration, cancellations, comb filtering, or muddy transients. When a host application, such as SONAR, compensates for the plug-in’s overall latency, the resulting linear-phase output is referred to as “zero-phase”. LP-64 EQ is well suited for critical mastering projects. For more information, see the LP-64 EQ online Help. The LP-64 Multiband Compressor consists of five high-quality compressors, each operating on a single adjustable frequency band. 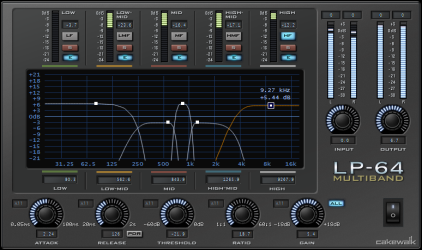 Unlike typical limiters, the filters that split up the frequency bands in the LP‑64 Multiband Compressor plug-in are of the Linear Phase variety. This allows you to split up the spectrum into bands and then sum them back together with no phase errors or colorations. Most typical limiters color the sound even if they are doing nothing, because the splitting/re-combining of the bands is done with IIR (Infinite impulse response) filters with phase shift. For more information, see the LP-64 Multiband online Help. 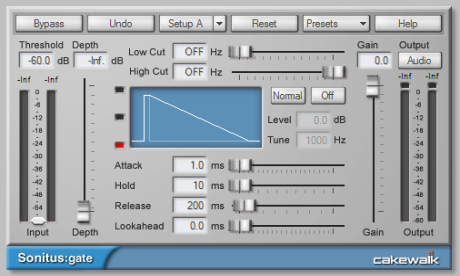 Mod Filter produces a dynamic filtering effect, in that the actual filter can respond to incoming signal or follow the cycle of a tempo-synchronized LFO. The filter itself is a low-pass filter type, which filters out higher frequencies. For more information, see the Mod Filter online Help. Chorus/Flanger lets you add depth and thickness to the signal. The EQ section in the feedback path allows you to create some truly unique sounds. For more information, see the Multivoice Chorus/Flanger online Help. 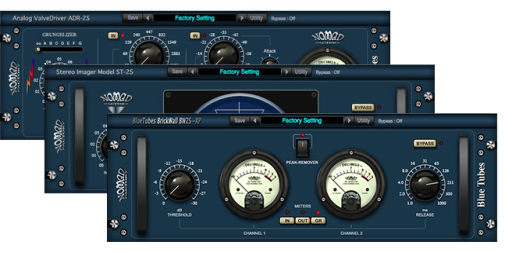 The Blue Tubes Bundle V3 from Nomad Factory is a collection of 18 vintage-style audio processor plug-ins that recreate the warm sound qualities of classic analog hardware. For more information, see the Blue Tubes online Help. The Blue Tubes Analog Trackbox from Nomad Factory is a vintage-style analog channel strip featuring single-triode to dual-triode tube emulation, gate/expander, compressor, and equalizer. Analog TrackBox combines all the best elements of the Blue Tubes Tube Emulator, CP2S compressor and PEQ332 parametric equalizer to create a truly flexible and spectacular sounding valve front end for any track. For more information, see the Blue Tubes Analog Trackbox online Help. The BlueVerb DRV-2080 from Nomad Factory is a vintage-style studio reverb designed to recreate the qualities of digital reverbs from the 1980s. It includes individual two-band equalization, as well as ambiance, decay RT60 and pre-delay controls. Use it to sweeten mono or stereo tracks, or add dimension to an entire mix. For more information, see the BlueVerb DRV-2080 online Help. Para-Q is a two-band true parametric EQ that can be used to boost or attenuate generally high or low bands of the signal. It consumes very little processing power, which allows you to use it on many tracks simultaneously. For more information, see the Para-Q online Help. The Perfect Space convolution reverb is a stereo convolution processor. The process of convolution allows you to apply the acoustic characteristics of any space (or sound) to any input signal. Perfect Space can work with a latency as low as 64 samples (1.5 ms at 44.1kHz), making it possible to use it during tracking. The process of convolution allows you to apply the acoustic characteristics of any space to any input signal. These acoustic characteristics are captured within audio files called impulse responses. An impulse response can specifically represent a certain location, from a famous cathedral to a locker room shower. Impulse responses (IRs) are created by recording the reverberations within these spaces after playing special tone sweeps or firing a starter pistol. These wideband “impulse” sounds typically span the entire audible frequency range, so the recorded “response” includes a complete representation of how the space reacts to all frequencies. Use IRs of this type to change your project’s performance location without moving an inch. Convolution is not limited to emulating pre-existing spaces, though. In fact, you can use absolutely any sound (drums, claps, screams, towel snaps, etc.) to manipulate your source audio. With creative convolving, you can achieve very interesting filter, reverb and delay effects. In the context of using Perfect Space, an impulse response is a standard mono, stereo or multi-channel uncompressed .wav or .aiff file of any bit-depth. In addition to using the impulse responses included with SONAR and files from your own libraries, you can find many impulse responses for free on the Internet at Web sites like www.noisevault.com. For more information, see the Perfect Space online Help. ProChannel is an extended channel strip that provides high-quality compressor, equalizer, and tube saturation processing for each audio track, Instrument track and bus. ProChannel appears as a module in the Track Inspector and Console view. For more information, see ProChannel (Producer and Studio only). PX-64 Percussion Strip is a multi-functional plug-in that combines a series of effects specifically optimized and streamlined for drum and percussion processing. Combining transient shaping, compression, expansion, equalization, delay and tube saturation in one convenient plug-in, PX-64 Percussion Strip is designed to make it fast and easy to enhance any drum or percussion track. For more information, see the PX-64 Percussion Strip online Help. 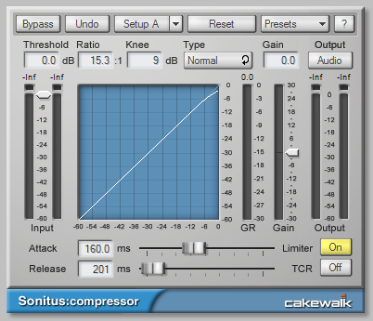 fx:compressor is a variable-knee compressor with built-in peak limiting. The purpose of a compressor is to limit the dynamic range of music or sound. Compression will make the loud parts of the signal more quiet, resulting in a more or less even level. 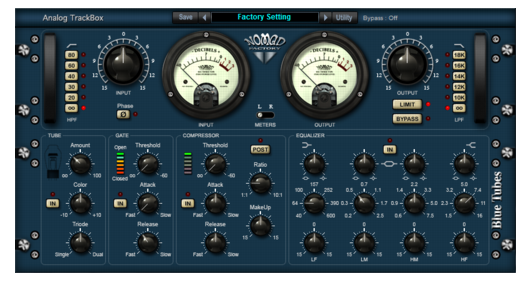 For more information, see the Sonitus fx: Compressor online Help. The Sonitus Surround Compressor is an enhanced, surround-capable version of the Sonitus:fx Compressor plug-in. The Surround Compressor is comprised of four stereo compressors. After you patch the compressor into a surround bus, you can direct any combination of the bus's input channels to any of the four compressors, sending any combination of stereo channel pairs, the center channel, and the LFE to the compressor(s) you choose. By default, all channels feed into compressor 1, and you can then redirect channels to the other three if you want. 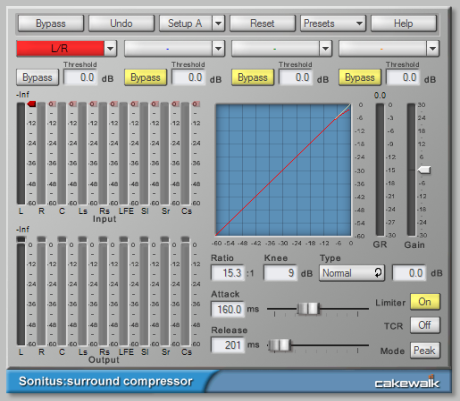 For more information, see the Sonitus fx: Surround Compressor online Help. 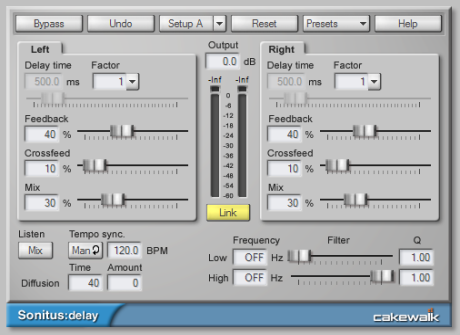 fx:delay is an advanced stereo delay with tempo sync. For more information, see the Sonitus fx: Delay online Help. 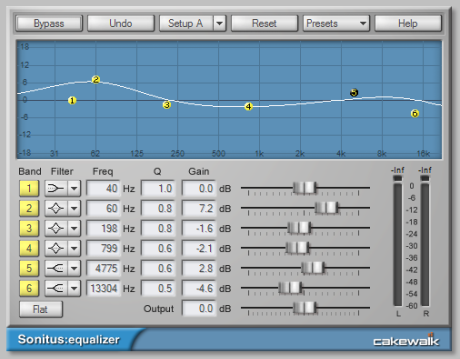 fx:equalizer is a 6-band parametric equalizer with selectable filter types for each band and frequency response graph. Equalizers are instrumental in fine tuning the frequency spectrum in all kinds of music and sound. They let you use different filtering techniques to attenuate, cut or boost a specific frequency or a range of frequencies, allowing you the shape the overall characteristics of the audio signal. For more information, see the Sonitus fx: EQ online Help. 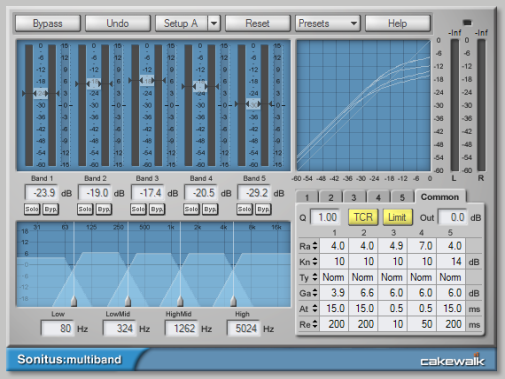 fx:gate is a dynamic gate with side-chain filtering and lookahead. The fx:gate plug-in has wide variety of uses. It can function as a noise gate, which quite simply gates (or blocks) signals whose amplitude lies below a certain threshold, and lets other signals through. This is useful for eliminating background noises, such as hiss or hum, during periods of silence in a recording or performance. In addition, it also features a tunable peak Punch mode that makes it possible to add transient punch to frequencies lacking in individual drum sounds, adding greater definition and presence to the gated signal. 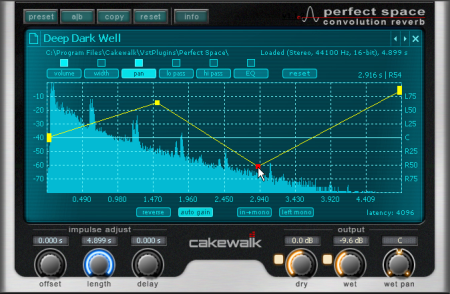 Using the variable high pass and low pass side chain filters enables you to perform “frequency conscious” gating. The gate can also be switched from Gating to Ducking mode for removal of clicks and pops. For more information, see the Sonitus fx: Gate online Help. fx:modulator combines six time-varying modulation effects into one integrated plug-in. For more information, see the Sonitus fx: Modulator online Help. 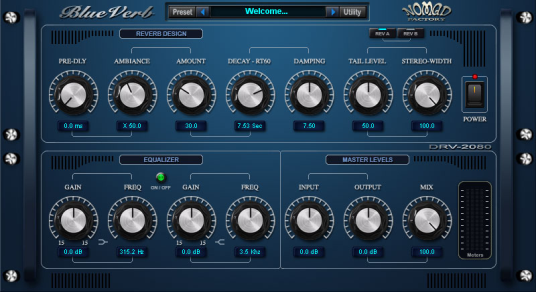 fx:multiband is a 5 band variable knee compressor with both normal and vintage compression modes and output limiter. Using a multiband compressor has many advantages over using a traditional (“single band”) compressor when it is used on audio signals containing complex harmonic material like a complete music mix. “Pumping” is virtually eliminated. “Pumping” is a phenomenon that is noticed when music with a heavy bass beat is run through a standard compressor; the mids and highs seem to vary in amplitude or “pump” to the beat. Multiband compressors don't pump because the bass frequencies are processed in a different compressor from that used to process the mid- and high range frequencies. The signal is equalized as it is compressed, so that differences in equalization between different sources are less noticeable. Multiband compressors suppress or enhance the dynamic properties of specific frequency ranges. Based on this, they can also be used for tasks like de-essing, pop removal, adjusting vocal and/or instrument punch and breath (attack and release curves) within a mix. For more information, see the Sonitus fx: Multiband online Help. 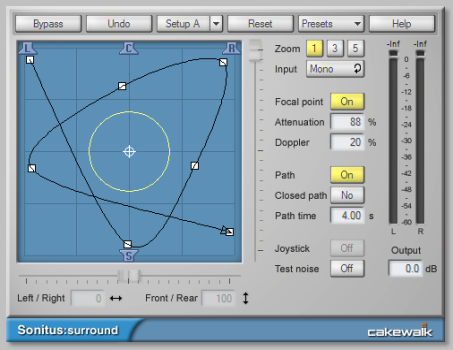 fx:phase lets you arbitrarily adjust the phase of a sound. Note: fx:phase is a phase shifter or phase delay - it is not a phaser, which is an entirely different type of effect. A phaser creates modulation effects by adjusting the center frequency of cascaded allpass filters, whereas fx:phase is used for applying a constant phase shift at all frequencies. For more information, see the Sonitus fx:Phase online Help. Reverb or reverberation is the effect of resounding echoes in a room or other enclosed acoustic environment. Reverb can be seen as a series of echoes so dense that they can't be told apart from each other. fx:reverb emulates the phenomenon of sound being reflected off walls in a virtual room, and allows you to add reverb that resembles the character, decay and frequency response of various environments. 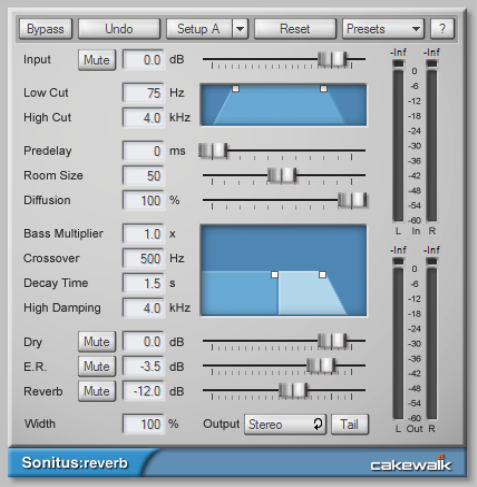 For more information, see the Sonitus fx: Reverb online Help. fx:surround is a surround sound panner with built-in Doppler and attenuation rendering for distance and velocity effects, joystick control and graphical path editing. For more information, see the Sonitus fx: Surround online Help. 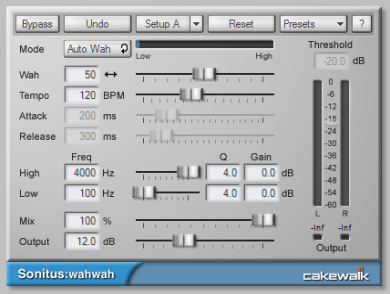 fx:wahwah is a guitar effect emulator. A classic guitar effect, the wahwah stomp box became an instant hit when it was introduced in 1966. The Vox wahwah was the first, and was soon followed by a multitude of similar designs. It was dubbed wahwah because of its unique vocal-like sound. fx:wahwah is a digital adaptation of the analog designs, and is modeled after real-life wahwah stomp boxes like the Morley Pro Series Distortion Wah, Jim Dunlop Crybaby Model GCB-95 and Model JH-1 (Jimi Hendrix). For more information, see the Sonitus fx: Wah Wah online Help. Stereo Delay produces a tempo-synchronized echo on whichever channel it is patched to. The three-band EQ section in the feedback path allows you to create some truly unique sounds. For more information, see the Tempo Delay online Help. 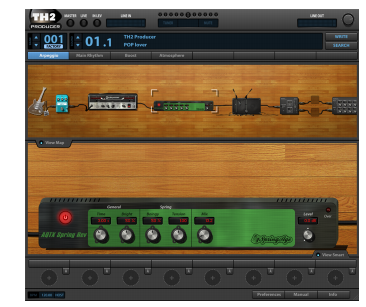 TH2 Producer by Overloud provides realistic guitar amp models from clean to crushing distortion. This special edition includes 10 amplifier models, 10 cabinet models, 10 stomp box effects models, 3 microphone models, delay and reverb master effects and dozens of presets. Easily build or modify your own signal path. For more information, see the TH2 Producer online Help. 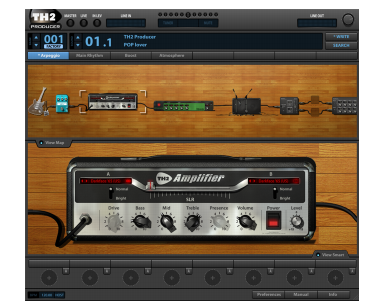 TH2 SONAR by Overloud provides realistic guitar amp models from clean to crushing distortion. This special edition includes 10 amplifier models, 10 cabinet models, 3 microphone models, and dozens of presets. Easily build or modify your own signal path. For more information, see the TH2 SONAR online Help. The TL-64 Tube Leveler plug-in is a preamp/processor that employs advanced analog vacuum-tube circuit modeling, which allows you to apply ultra-high-quality analog warmth and saturation to tracks and mixes. TL-64 Tube Leveler provides complete models of entire vacuum-tube circuits. Under the hood are dynamic, virtual vacuum-tubes that mimic the “animated” nature of their real, analog counterpart as they respond to different input audio. The result is the coveted warm, lively and realistic analog sound of classic vacuum-tube processors and amplifiers. Digital audio recordings can sometimes sound sterile and lifeless. Use TL-64 Tube Leveler to add just the right amount of warm tube saturation to individual tracks or full mixes. For more information, see the TL-64 Tube Leveler online Help. BiFilter2 is a powerful high-end quality stereo filter module, which features dual multimode filters with 47 unique and different sounding filter types, plus 8 distortion types, FM, AM, wave shaping, bit crushing, resampling, comb filtering, vocal filtering, EQ, and reverb. The high precision display shows the frequency response of the filter in realtime. For more information, see the BiFilter2 online Help. The TS‑64 Transient Shaper plug-in provides powerful control over the dynamics of audio tracks and mixes. In a musical context, the term transient refers to a sudden increase in sound output that occurs for a short period of time. For example, the attack portion of a drum hit is a transient. Unlike a typical compressor, TS‑64 Transient Shaper lets you shape the audio signal’s attack phase independently of the decay/sustain phase. TS‑64 Transient Shaper is primarily designed for drums and percussion, but can also be useful on other percussive sounds, such as guitar and electric piano. Shape the transients independently of the tail or ambience. For more information, see the TS-64 Transient Shaper online Help. VX-64 Vocal Strip is a multi-functional plug-in that combines a series of effects specifically optimized and streamlined for vocal processing. Combining compression, expansion, equalization, deessing, doubling, delay and tube saturation in one convenient plug-in, VX-64 Vocal Strip is designed to make it fast an easy to enhance any vocal track. 5 professional quality effect modules, each with its own bypass toggle. All modules are specifically tuned for vocal processing. Advanced tube saturation modeling available on input, output and EQ modules. Deesser with switchable center frequency and threshold. For more information, see the VX-64 Vocal Strip online Help.